Did you know that air leaks throughout your home contribute, on average, an extra 10%-30% on your electric bill? Given that the average American electric bill has only been rising for the last 10 years, finding and fixing these air leaks could be more important than ever before. Luckily, the process for finding some of these leaks is quick and inexpensive. 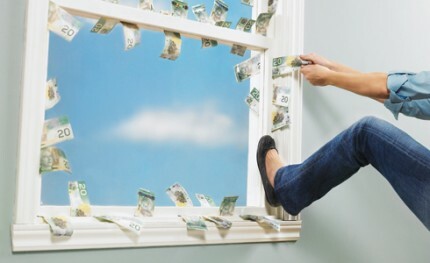 Just follow these easy steps to stop your money from flying out the door or window. A laser thermometer allows you to take the average temperature of an object or area simply by pointing and pushing a button. Although this isn’t a tool most people readily have on hand, you can pick one up from any hardware store or online for as little as $15. It’s a beautiful, simple, and elegant device. Just point and shoot the laser at an object, and you’ll get a temperature reading from the spot you’ve pointed at. Try it by shooting the laser into your morning coffee–it might even save you burning your tongue. Instructions: how to check for air leaks around your doors and windows. 1. Close all the windows and doors you want to test. The only way to be sure that you’ve found an air leak is to have all of your doors and windows closed. Doing so will help prevent you from getting a faulty test result. 2. Get some base readings with the laser thermometer. Shoot the laser thermometer beam onto the walls around the window or door you want to test, just to get a sense of the ambient temperature in the room. Also just to compare, get a reading outside. This will give you an idea of what you’re looking for–if you spot an area inside the house where the temperature more closely matches the temp outside the house than the rest of the inside, you know you have a major leak area. 3. Slowly shoot temperature readings around the door or window frame. Move slowly so that you can see if there is any one particular spot on the door or window frame that reads a significantly different temperature than the rest of the frame. If you get a blip, circle back around several times over the area with the laser, trying to hone in on the leaking area. 4. Repeat steps 2 and 3 for all of the door and window frames in your home. All it takes is one air leak somewhere in your home for your energy bill to start rising. So check and make sure that all your windows and doors are properly sealed. 5. Visually inspect the seals for any doors or windows with a suspected air leak. Sometimes dirt or other debris can get caught in the seal and prevent it from closing properly. Check and make sure that’s not the case with yours. If your seal is damaged in any way, it’s probably time to have it repaired or replaced. It’s probably a good idea to do this test once during both the winter and summer. As the wood in your home swells and shrinks with the change of seasons, it could cause an air leak to develop. This quick and simple test should help to reduce both your heating and cooling bills and keep your home working comfortably and efficiently. Next step, caulk those door and window leaks!